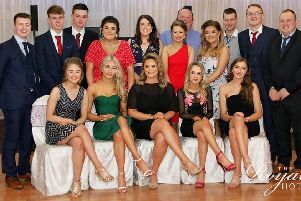 Saturday, March 16 brought the return of the hugely popular Young Farmers’ Clubs of Ulster Arts Festival Gala. The event was held at the Millennium Forum, Londonderry. Sponsored for a number of years by NFU Mutual Charitable Trust, the Arts Festival Gala saw the top clubs from the YFCU’s arts festival perform to a packed audience of family, friends, industry representatives, MLAs, MEPs and distinguished guests. A VIP reception sponsored by Chestnutt Animal Feeds was also held before the performances. Each club performed a short drama piece which the members wrote and produced themselves. The outstanding performance of the night award went to Kilraughts Young Farmers’ Club. Thank you to the sponsors NFU Mutual and Chestnutt Animal Feeds Limited.